We are here. I know, we said that yesterday, but when we woke this morning we were really here, it wasn't just a dream, and by this afternoon it felt to both of us as though we had been here forever. Can it be possible that we have contracted jet lag while travelling at eight kilometres per hour? We've experienced this odd kind of dislocation deja-vu on other occasions too, and it's usually as was the case today, when we receive a visit from someone from our "previous life", an event which our brains find impossible to place in its correct context. In downtown Paris, having lunch with Kerry, and Vanessa, who now sounds so amazingly Dutch when she speaks that it's hard to believe she was once thirteen years old and washing dishes in the back of one of our stores, and Maarty who is the reason for her accent, was just one of those events. The topics of our conversations are so familiar that our brains are telling us we are having them on the other side of the world. 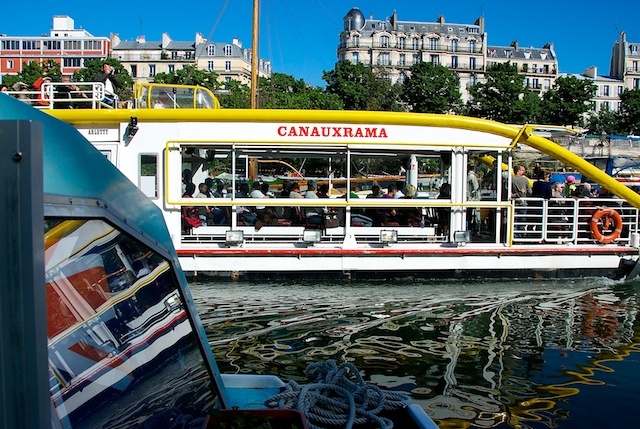 We just can't explain the feeling of disorientation which goes on for the entire time they are aboard, except for every now and then as a tour boat glides past our window when we are brought back to Paris again. They left to catch their train to Amsterdam, we had a snooze, and when we woke were are again in the right hemisphere, the one where our internet connection doesn't work as it should except when we go into the provider's shop to demonstrate our problem. The shop where the nice young man smiles and shakes our hand as we leave, delighted to have been no help at all.